I recently drew a new cover design for Under the Electric Sun, the science fiction novel I wrote back in 2012. I was never happy with the earlier cover. Here is a photo of the new version. No, I didn’t put greasy Saran Wrap over the camera lens. I took this picture with my prepaid cellphone, a tedious little device that demands to be recharged twice a day. Sometimes, you just do the best you can. Under the Electric Sun is available in paperback for $6. The Kindle version is 99 cents. You can click here to order. I hope you’re enjoying the cool weather — if you happen to live in this part of the world. Have a lovely weekend. I drive a forklift in a dim, hazy factory. The rest of the time, I write and draw. 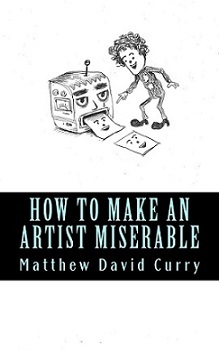 "How to Make an Artist Miserable" is a book about the annoying things people say to artists. It's available on Amazon. 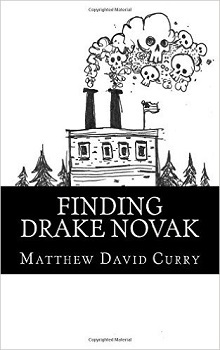 The sketches, colored pencil drawings, and written works on this blog are copyrighted by Matthew Curry and cannot be copied, downloaded or used in any way without express written permission.